T-28 Bakery & Cafe: Dirt Cheap Midnight Snacks | GrubGirl. I went there with EC after playing some volleyball Friday night. It was billowing fog again…not your typical summer evening, unless you’re in San Francisco. This place is way out in the Outer Sunset, serves a mainly Asian-American crowd, and serves Hong Kong-ish style or Malaysian-type Chinese food. That is, there are elements of a Western twist on the menu, like the Fried Spam Macaroni, or the Fried Ham and Cheese Roll. 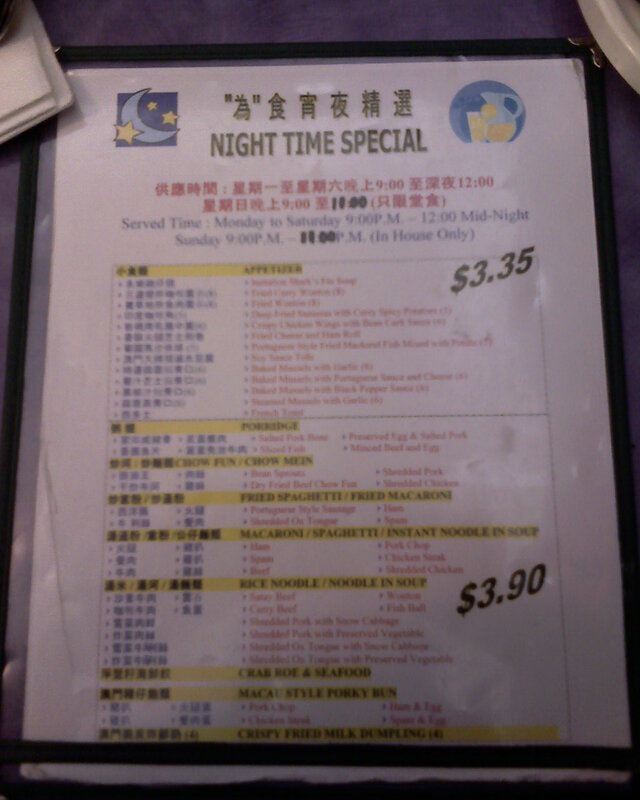 They’re open late (until midnight), require cash only, and the late-nite menu is dirt cheap. A special menu served dishes for less than $4! See what bargains you can find when a huge portion of the meal isn’t carved out for rent? The dishes are very simple — the Fried Spam Macaroni was macaroni pasta sauteed with diced Spam and some chopped bok choy. It was seasoned with usual Chinese ingredients to lean the dish to a more Asian flavor — soy sauce, peanut oil perhaps, maybe a little oyster sauce. I also ordered Chicken Chow Fun, to test out an easy Chinese restaurant dish. Quantities were good, though the amount of chicken was a bit sparse. The sauteed chow fun had done a great job of soaking up whatever oils were used to cook it. Overall, if you’re up for making a drive out there for some late-night Chinese-American food that’s cheap and alright, you might as well head out over here.